In the second LFB webcast-tv broadcast of the regular season, Lattes Montpellier walked over their hosts Villeneuve d'Ascq (72-59). Ana Cata-Chitiga was absent for Montpellier due to being suspended because of the number of technical fouls accumulated in the last few months. For the hosts Émilie Duvivier and Sandra Pirsic already injured last week, were joined by Lenae Williams on the injury list. 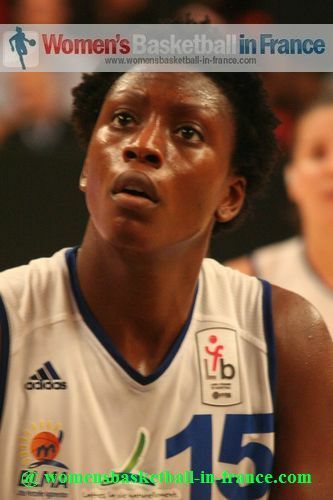 Fatimatou Sacko who had played for Villeneuve d'Ascq between 2004-2009 finished with 23 points and 13 rebounds to lead Monpellier to a comfortable victory (72-59) over Villeneuve d'Ascq. Géraldine Robert also from Montpellier had 15 points and 9 rebounds in her first visit back to the club she had been between 2006-2009. Villeneuve d'Ascq had another poor shooting day and despite the efforts of Amélie Pochet (17 points) and the work horse Bintou Dieme, they were never in the game. You can watch the Webcast-TV broadcast of this match below after our game report. Lattes Montpellier had the better start to the LFB match, leading (8-2) with just under four minutes played. However 2 first-quarter fouls each for Géraldine Robert, Gaëlle Skrela and Lidija Turcinovica were to slow them down and allow their hosts back into the game. Villeneuve d'Ascq went 9-of-10 from the free-throw line and only trailed (16-19) by the end of the first quarter despite being dominated in all sectors of the game. Amélie Pochet (in picture) was the leading scorer with 11 first-quarter points. The second quarter did not start well for the hosts with Olayinka Sanni picking up her 2nd foul after the first 20 seconds. Villeneuve's difficulties in scoring from open play continued as they went scoreless for over five minutes while Montpellier hit 15 unanswered points (39-22) to take complete control of the game. A baseline three-pointer by Bojana Vulica at the end of the quarter gave the home fans something to cheer about. However Fatimatou Sacko (below right) from Lattes Montpellier was enjoying herself with 18 first-half points and 8 rebounds as her team led (41-27) at the break. After half time the visitors from Montpellier hit the first 6 points of the match to move 20 points clear (47-27). The hosts had to wait almost five minutes for their first score of the second half which was a three-pointer by Jennifer Digbeu. Sanni who was having a hard time scoring finally opened her account with 27 minutes played. For a moment Villeneuve gave the impression that they could come back. However on the buzzer Edwige Lawson-Wade, just free behind the free-throw line, hit a jumper to maintain her side's 20-point lead (57-37). Lattes Montpellier pushed their advantage up to 26 points with five minutes to play (69-43) and then stepped off the accelerator. Villeneuve d'Ascq, on the other hand, started playing better and had a 14-0 run, but it was a case of too little too late. With Virginie Brémont from Lattes Montpellier finishing the game with a three-pointer the final score was (72-59) for her side.